Image courtesy of Sports Tonight Television. Please click image to view YouTube playlist. Sports Tonight Television has a new weekly show that airs live via Internet streaming on Monday evenings at 2200 from London, England: World Football Show. 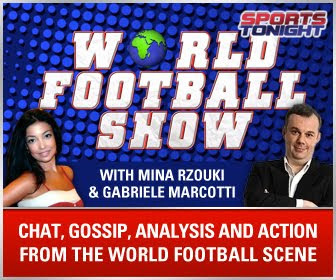 The show is hosted by respected sports journalists Mina Rzouki and Gabriele Marcotti. According to Neil Stacey, the producer of the show, "Sports Tonight Live which is the channel we are on, was launched a few months ago. We are the first UK channel to be exclusive on Freeview HD content. We upload the episodes immediately to YouTube." Phillippe Auclair: French and European football. Andy Brassell: English and European football. Rafael Honigstein: German and European football. Tancredri Palmeri: Italian calcio and European football. One feature that I like is a live look at the guest contributors via Skype. This lends a personal touch to the show and allows the pundits to reach out to their audience in a different way. The show also invites participation from its audience. For example, last season the co-hosts provided a weekly opportunity for viewers to vote on their "Best XI" team of all-time at a new position during each episode. These interactive components make the show stand out in a positive fashion. Please take a look at one of their recent episodes from the embedded video below. Please follow @STWorldFootball on Twitter.